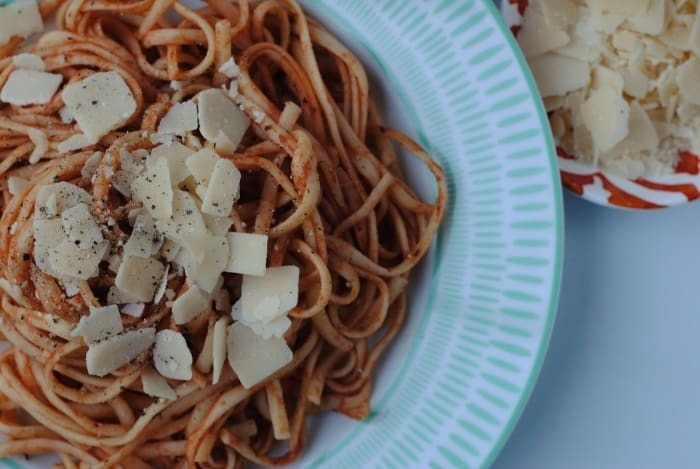 When you want something quick and simple for dinner, this Easy Tomato Pasta Sauce stirred through some spaghetti is about as simple as it gets. No need for any extra ingredients, although a little parmesan and black pepper on top goes a long way. A herby tomato based sauce with a splash of balsamic vinegar that freezes well too. One of the things I have learnt from my trips to Italy is that everyone outside of Italy really over complicates Italian food, and I am definitely guilty of this too. You only have to look at how many toppings we put on our pizza, or how many different ingredients we add to our pasta dishes to see this. In Italy, their food tends to be much more simple, and I think it is tastier because of it. 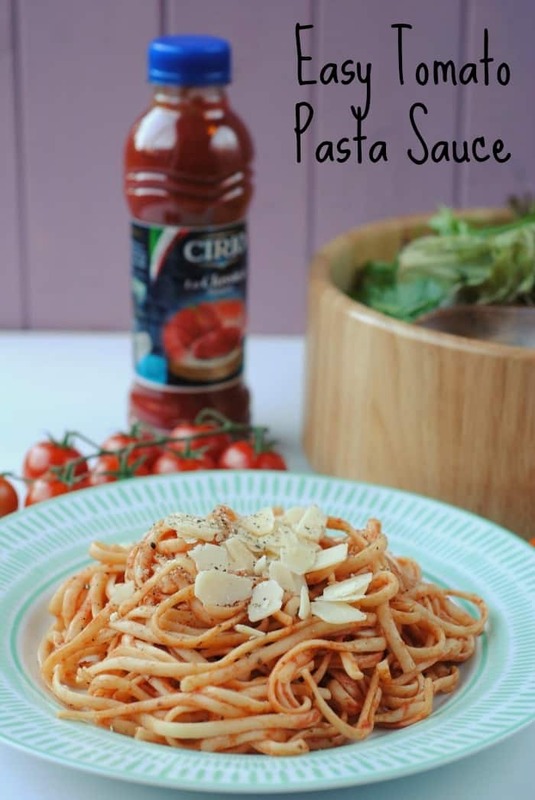 We have kept this pasta sauce really simple with just a good quality passata, some fresh and dried herbs, garlic and a splash of balsamic vinegar. There are plenty of other ingredients you could add to it, like vegetables, or meat, but if you want something quick and simple then this is a great base. This is an easy recipe, but of course it would be easier to just open a jar of store bought sauce. But, next time you are in the supermarket, take a look at the ingredients of some of those pasta sauces. Some (not all – there are some great options out there now) contain so much salt, sugar and unnecessary ingredients. Making your own pasta sauce means you can control exactly what goes in to it and you can use just a pinch of salt to season it. The splash of balsamic gives it a little sweetness too. Passata (or tomato puree as it is called in the US), is strained tomatoes (liquid tomato puree). It will come in a carton or tall glass jar and it is a store cupboard essential in our opinion, as it is the base of so many sauces that we make. 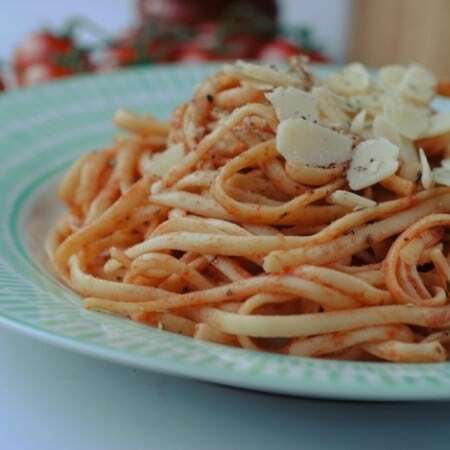 Passata is an uncooked tomato purée that has been strained of seeds and skins. If you can’t find any passata, then an alternative would be to blend up a tin of tomatoes and then pass it through a sieve. This Easy Tomato Pasta Sauce is perfect for batch cooking. Triple the recipe and then freeze it in portions. Then all you need to do it get it out the night before to defrost and heat it through some cooked pasta (or use it as a pizza base sauce) for a quick week night meal. One: Heat the oil in a frying pan and add the onion and garlic. Gently cook until softened, about 3-4 minutes. Two: Add the passata, herbs and balsamic vinegar and season. Stir and simmer for 10 minutes. Three: Stir through cooke spaghetti and add parmesan. You can use this simply stirred through pasta, as a spaghetti bolognese sauce or as a pizza base sauce. It freezes really well, so feel free to triple the recipe and batch cook it. This is a simple sauce, but you can use it as a base and add vegetables or meat to you. Cooking times will vary though. This is a vegan sauce, but some parmesan or vegan alternative, is really nice sprinkled on top after cooking. Sometimes you just want something simple for dinner, and this Easy Tomato Pasta Sauce stirred through some spaghetti is about as simple as it gets. Cook the onion and garlic in a little oil until softened. Add the passata sauce and herbs and simmer for 10 minutes. Stir through cooked spaghetti and top with parmesan. Mmm sounds like a great midweek meal idea! Love pasta, me! Thanks for this simple recipe, my boys love pasta but they always complain about what’s in the jars, this will make a nice change. I don’t think you can beat a freshly made tomato sauce. I love making pasta sauces so will give it a try! What a fabulously simple recipe, thanks for sharing! I would never have thought of using those products. Thanks for sharing! 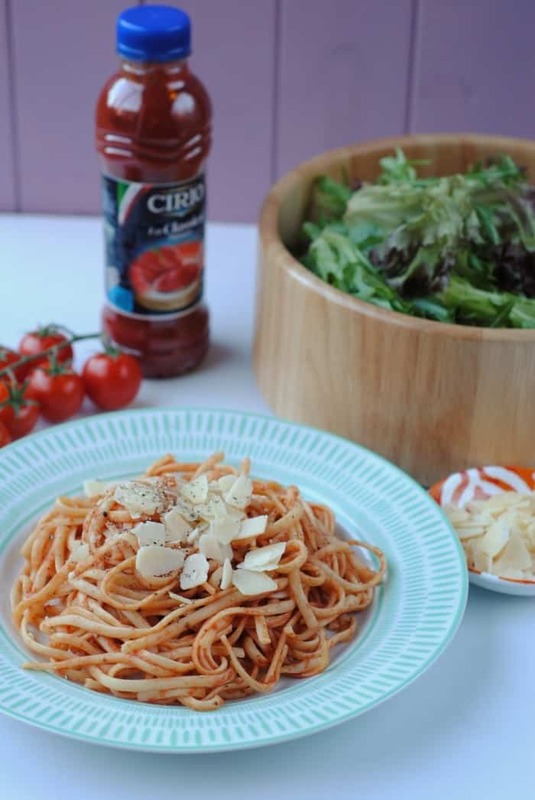 I’m a big fan of Cirio products and will go out of my way if necessary to get them when making something that requires something tomatoey – tinned, passata, paste. Congratulations on being their blogger ambassador – what a great gig! Completely agree that non-Italians often overcomplicate Italian food. Everything is either too muddled by too many ingredients or the flavours are overly concentrated. This looks like you’re really paring back to the essential flavours. 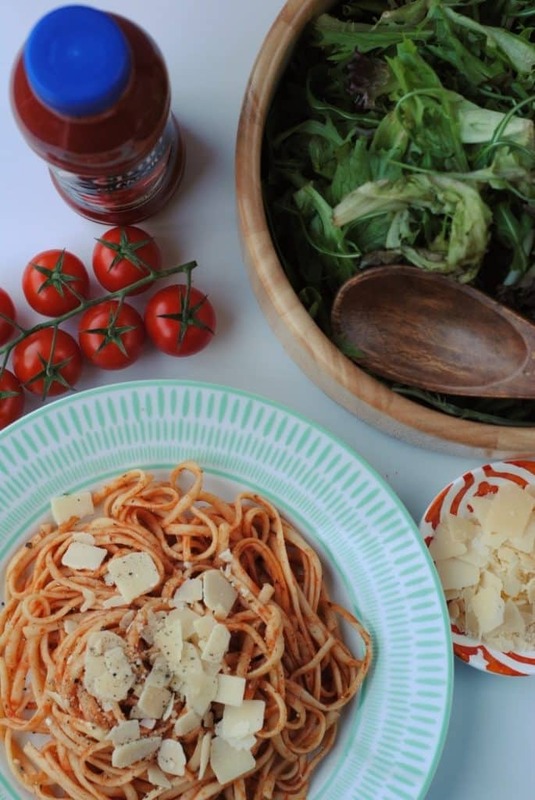 I made my own sundried tomato pasta sauce the other day and it made such a difference – so much nicer than shop-bought varieties! This looks very yummy. Would love to taste this. We are going to Italy in the summer and I am most looking forward to the food. This has gotten me in the mood for it even more now. We buy Cirio products too. Congrats on being an ambassador for them, I look forward to seeing what you come up with. I am a terrible cook, but I think I could even manage this. I would have to add some chicken or something to it though.